Note: this webpage is still under construction. This article differs from other content on my website which is primarily construction articles for fairly basic physics-related projects. Many hobbyist do construct their own quadcopters but I have not attempted this yet and think the complexity is greater than I will present at this time. Understanding the flight of a quadcopter does require some knowledge of physics and the relationship with microprocessor controlled devices. What I find most educational learning about quadcopters is that much of the technology needed for successful flight is because of mass marketed devices such as smartphones. Tiny electronic sensors provide data which is processed with computer code to provide the proper speed on each of the four electric motors that turn propellers providing thrust. The pilot directs the movement with a radio control transmitter like used for model airplanes or helicopters but there is considerable computer processing that must be done in the interface between the control stick movements and the resultant speed variations in the electric motors. 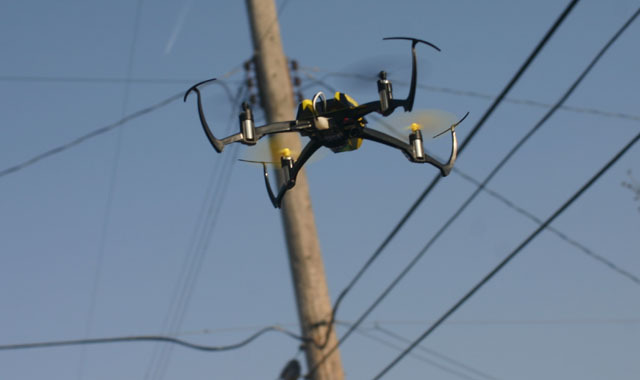 Most likely it is because of the technology employed in the large number of smartphones that some of this technology was available at an affordable cost to make the quadcopter possible. Tiny electronic components such as the accelerometers and gyros that shift the image on a smartphone when the smartphone is turned either horizontal or vertical keep the quadcopter flying relatively level. Images on the smartphone readjust from portrait to landscape as the position of the phone changes from vertical to horizontal. Data from the sensors and control input transmitted from the radio control transmitter must be processed with a tiny microprocessor on board the quadcopter. This can be from hundreds if not thousands of calculations and commands per second that must be processed. If you have ever experimented with LEGO robotics you might be familiar with creating computer programming code and downloading to a microprocessor that interfaces with electric motors and electronic sensors. Using a graphical interface on a laptop left image program code is transferred is transferred to robot right image seen here in competition hosted by Hightech Kids. 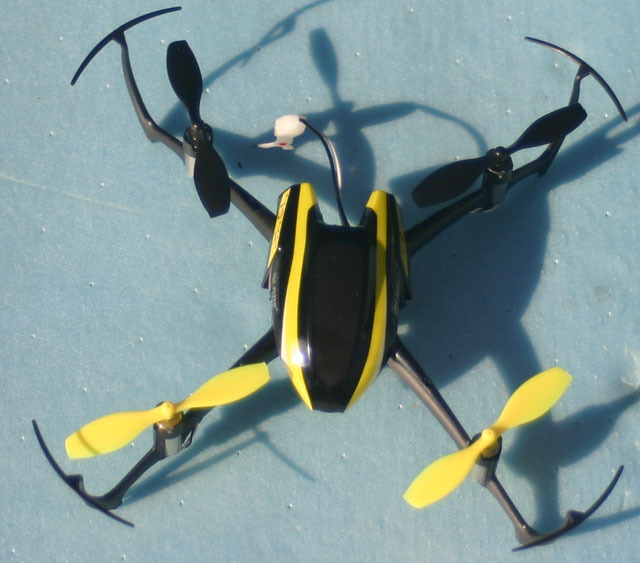 High-energy and lightweight lithium polymer batteries used in consumer electronics such as cellphones make it possible to get good duration in quadcopters. Note: either overcharging or discharging can damage the battery. 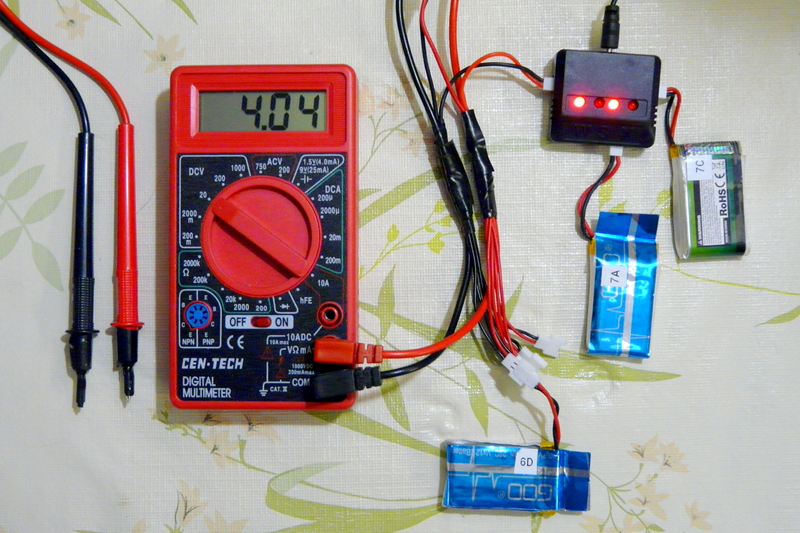 For a single cell battery fully charged is 4.2 volts and fully discharged is 3.0 volts, do NOT charge above 4.2 volts or discharge below 3.0 volts. 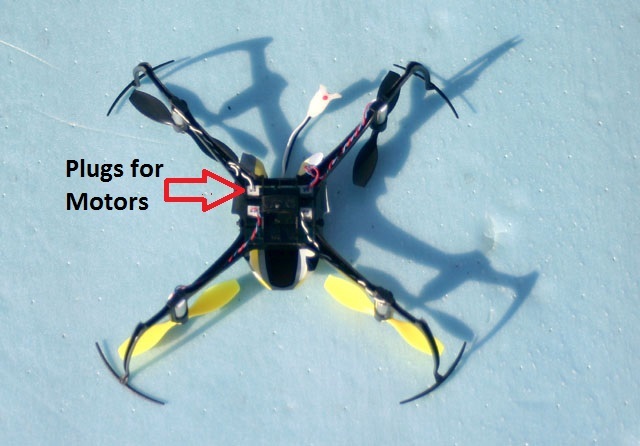 Most of the smaller quadcopters use coreless motors as this type of motor has advantages such as efficiency and response time. However, without the large iron heat sink of the cored motor the coreless tends to fail more often from overheating. Especially if the motor should become stalled, be sure to pull down the throttle all the way if you even think a motor could be stalled. In replacing a damaged motor you need to be sure that you have a motor designed for the correct rotation, there is a difference. On some quadcopters such as the SYMA X5C-1 the quadcopter must be partially disassembled and the wires need to be spliced which requires soldering. The replacement motor leads were color coded which is a help in matching up correct rotation and polarity. From my reading most people have the opinion that starting with a cheaper quadcopter is best. My experience has only been with quadcopters in the lower price range. 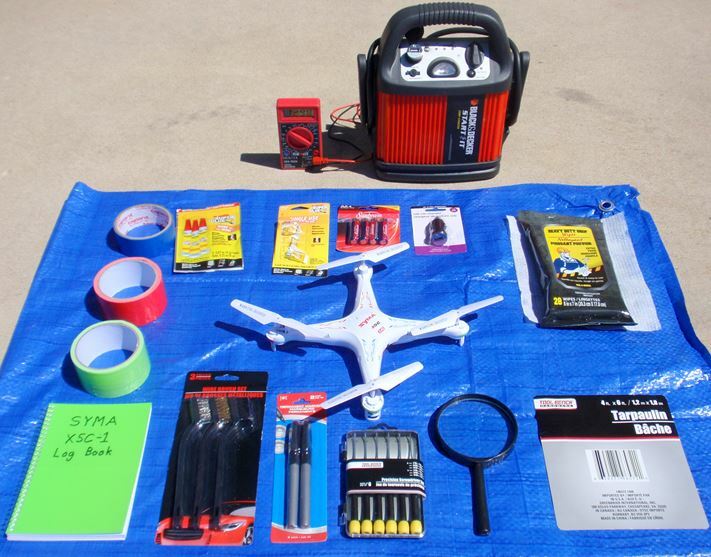 With the introduction of the tiny Estes ProtoX quadcopter in the $40 range, a huge number of people purchased or received this model as a gift. Not my first quadcopter but I had to have one as soon as I saw it in a hobby shop. With experience from a previous quadcopter and a couple of model helicopters I was able to fly it without too much trouble. 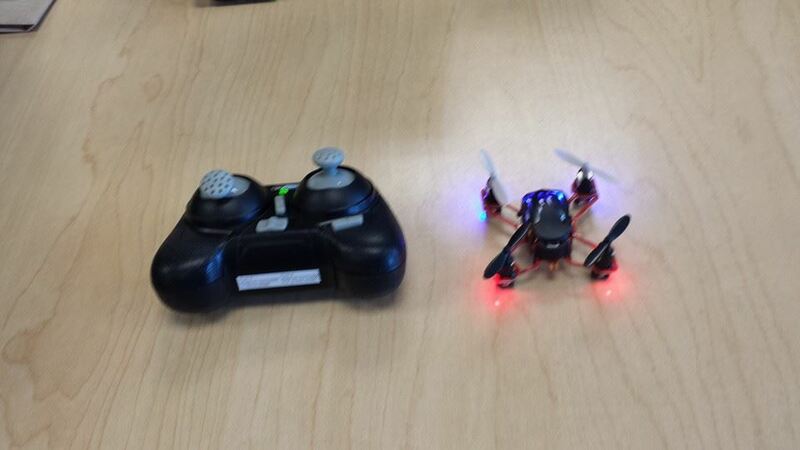 Tiny joysticks and on a tiny transmitter are part of why flying the ProtoX is more difficult than larger quadcopters. My first quadcopter was the Heli-max 1SQ which although relatively small still has a transmitter that is closer to normal size. 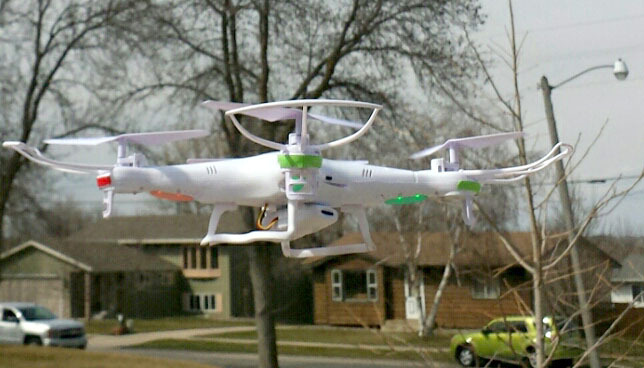 Another quadcopter I own is a AR Parrot Drone which was controlled with a wi-fi signal from a smartphone or tablet. The technology of this quadcopter is amazing making it more like a flying robot in that it could even land by itself just by pushing a button. Unfortunately at times it had a mind of its’ own and not fly where you wanted it to. Mine is no longer functioning after flying over a small lake and landing because it would not respond to my control. 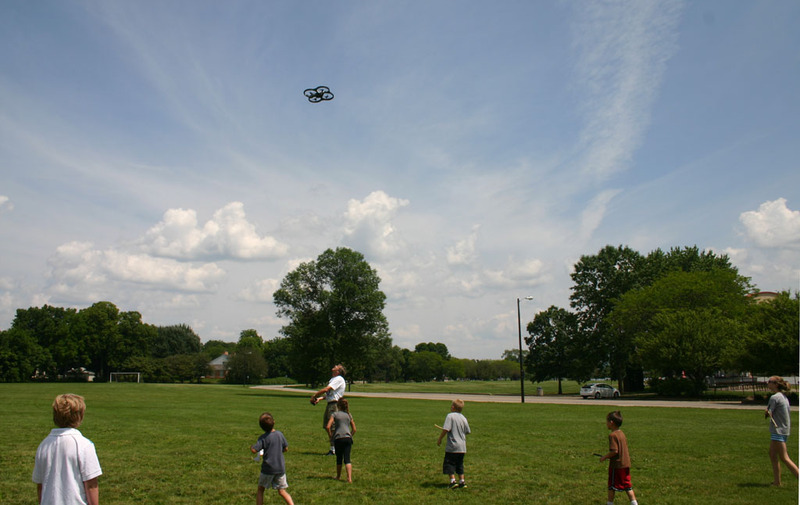 Flying the AR Parrot Drone 2.0 in a demonstration to parks and recreation summer camp group for a rubber powered model helicopter event. The newest quadcopter I have been flying is the SYMA X5C-1 which is slightly larger than the Heli-max 1SQ but still relatively small. It does include a removeable still/video camera and I consider a good value for around $60. * Become comfortable with the controls hovering in front of yourself with quadcopter pointed away from yourself. * Begin to work on smooth flying in a arc or circle. The propellers on a quadcopter not only produce a thrust behind the blades of the propellers but also produce a torque. Torque has been defined either as a twisting force or the tendency to rotate around an axis. The direction the blades must turn is determined by how the blades are angled. Propellers can be designed for either counter clockwise or clockwise rotation. 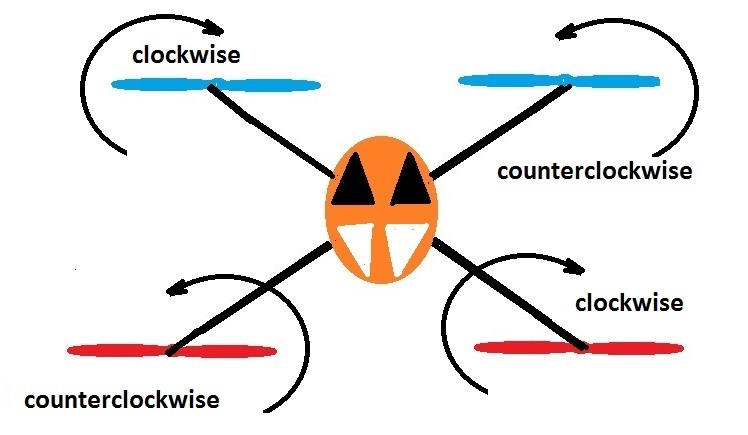 By having counter clockwise and clockwise propellers across from each other, this should help to cancel the net torque. Diagonally from a propeller on the quadcopter the propeller should be spinning the same direction. Note: attaching the incorrect rotation propeller on a motor shaft is a fairly common problem, take note when installing propellers. 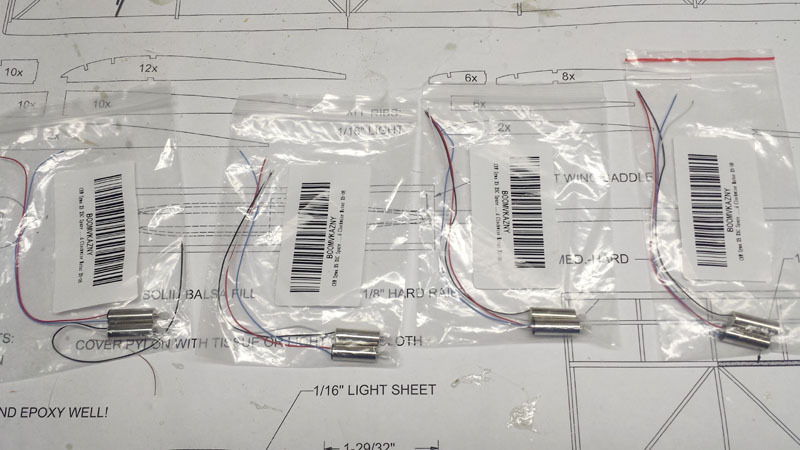 Also note that the tiny dc coreless motors can be designed to run in one direction only. Reversing the polarity and running the motor in the opposite direction could damage the motor. 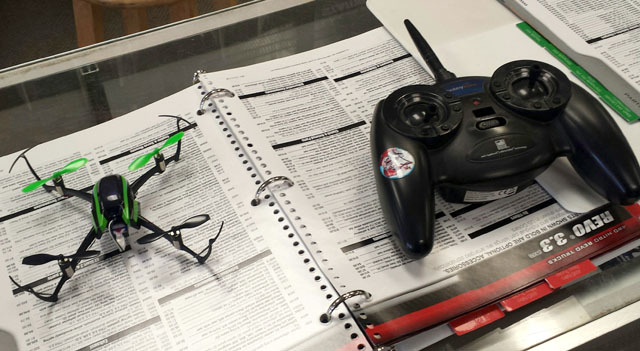 In talking to hobby shop employees at Everything Hobby that sell a lot of quadcopters, by far the largest number of problems seen with quadcopters are related to not resting the quadcopter on a perfectly level surface before taking off. Failing to calibrate on the level may result in one propeller not spinning or the quadcopter will start moving in one direction as soon as it takes off. After the quadcopter has completed the calibration phase on level ground, it might still want to move away from above the take off spot, this is known as “drifting”. To correct this as much as possible, slide the tiny trim lever opposite the direction the quadcopter is drifting. 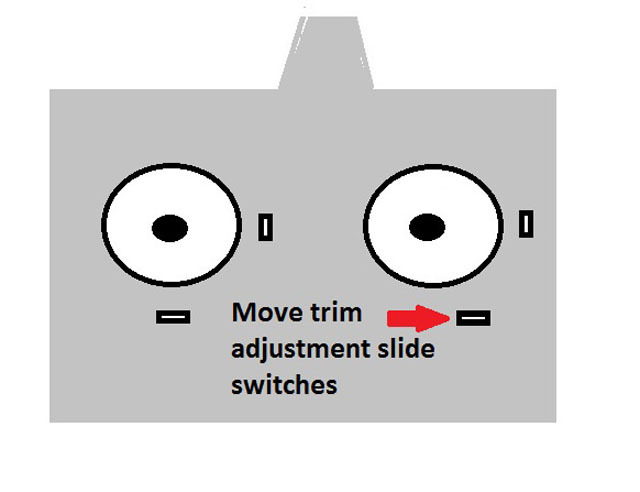 If you are unsure of which direction to move slide switches read the information below on control movements of the transmitter sticks. 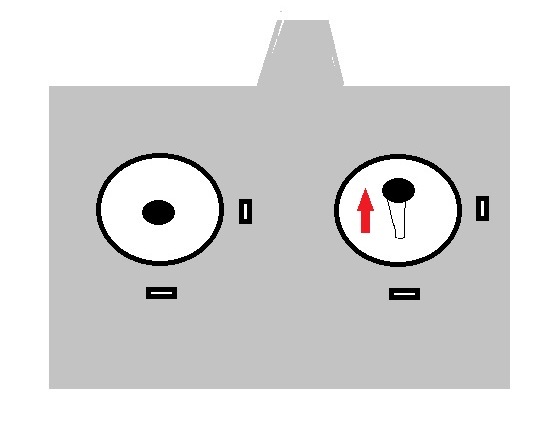 Moving the right stick left or right controls the roll axis. In a left bank the front and rear right motors will speed up causing the right side to lift more than the right side. Moving the stick to the right will have the opposite effect. Pushing the right stick forward that controls pitch will cause the rear motors to speed up creating greater thrust on the rear which will push the quadcopter forward. Moving the right stick backward will have the opposite effect. Moving the left stick to the left will yaw the quadcopter to the left which means it pivots on the horizontal plane around the center point. Motors that are diagonally across are sped up and opposite diagonal motor pair is slowed down. 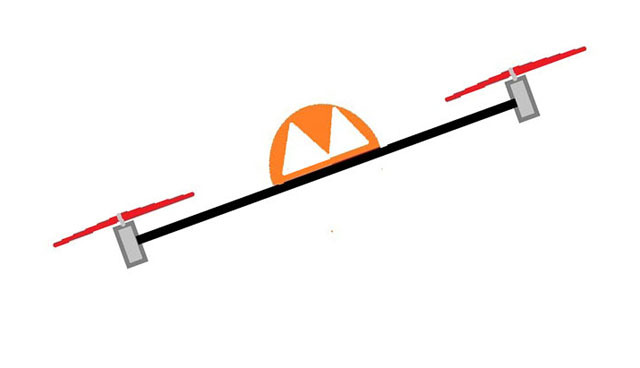 Torque is increases on the diagonal motor pair that is sped up. 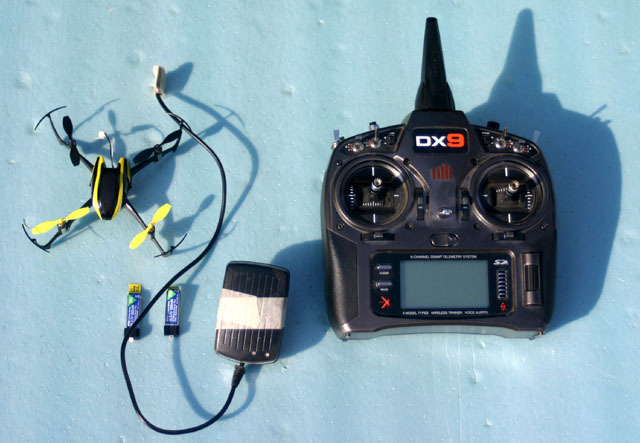 Successfully flying a quadcopter requires coordinating all four control functions at once much of the time. In learning I find it is best to start with the least control functions and gradually add more functions as you become more comfortable flying. To start with just work on gradually increasing the throttle and ascending to a couple of feet off the ground, work on adjusting the throttle to maintain the same altitude. If the quadcopter is drifting badly; I find it easier to land, make a trim adjustment, and take off again to see if the trim adjustment helped. Flying and adjusting trim switches at the same time can be tricky. When the trim seems good and you are comfortable with hovering in place, try moving one direction at a time. So from a hover of a few feet above the ground try pushing the right stick (pitch) forward slightly and see how the quadcopter reacts. Next pull the stick gently back to return the quadcopter to where it started. As it comes back you will need to give a small amount of control forward again to slow down and then stop the direction of motion. Learning to slow down and halt a motion is one of the most important skills a beginner needs to work on; otherwise the quadcopter gets away from you much like a person running on ice. If you have not operated other radio control models, the idea of control perspective will be new to you. That is when the model is coming towards you and a control input is given to the right, the model will move the opposite direction – left because of the perspective of the model. 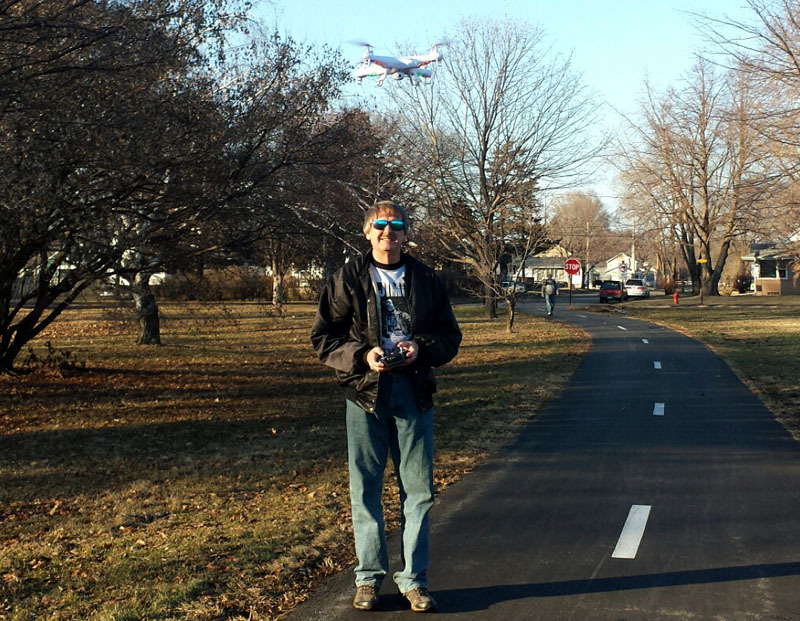 As you are first learning it is easier to always be behind the quadcopter when controlling it. 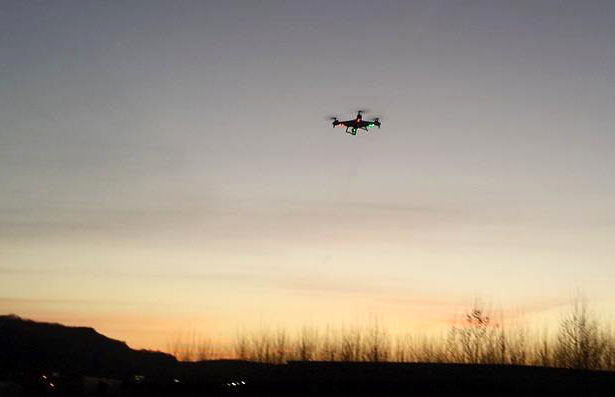 I find that I can see the lights on the quadcopter, if it has lights much better when it is starting to get dark outside. I do not advocate flying when it is really dark but just before sunset is really good and the wind is usually less. The problem is not that I cannot see the quadcopter in bright sun conditions but that it is hard to tell the front from the back. Flying model airplanes is much easier in that respect as the outline of wing and tail was more distinctive at a distance. 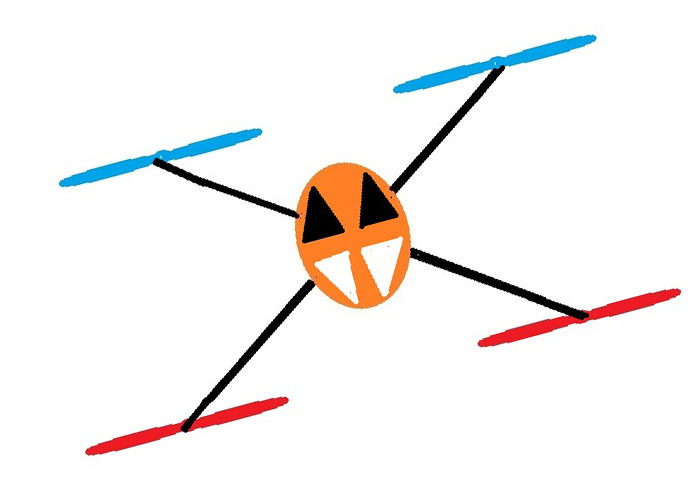 I asked the young sales associate – Nate at my favorite hobby shop Everything Hobby in Rochester Minnesota what the most popular quadcopter in the lower price range besides the Estes ProtoX was and without hesitation he told me the Blade Nano. It turns out the Nano was out of stock at the time so I ordered a Nano BNF (Bind-n-Fly) as I have a couple of compatible transmitters. What was also appealing to me was that I could use not only a transmitter I had but also several 150 mah Lipo batteries and an AC charger that charges two batteries at a time. 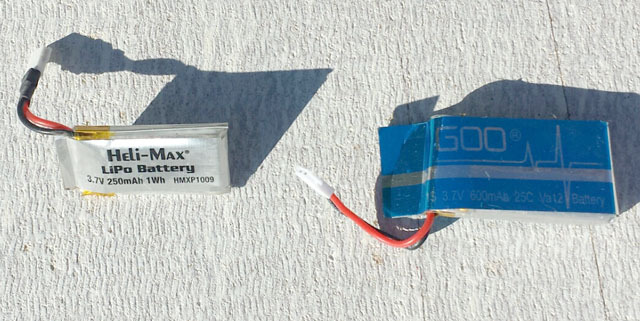 I had this equipment because I have three model airplanes that use the same batteries; UMX Radian, UMX ASK-21, and AS3Xtra. Another good feature with the Nano is changing motors is easy with the wires and connectors out in the open. Blade Nano in flight, it was rather windy last evening but the tiny quadcopter did pretty well, I noticed it tried to automatically adjust to the gusts of wind. The tiny connectors that the Nano and the airplanes uses can be a little finicky, I had trouble with the connector on the Nano until I carefully bent up one of the pins. After that plugging the connectors together was easy. 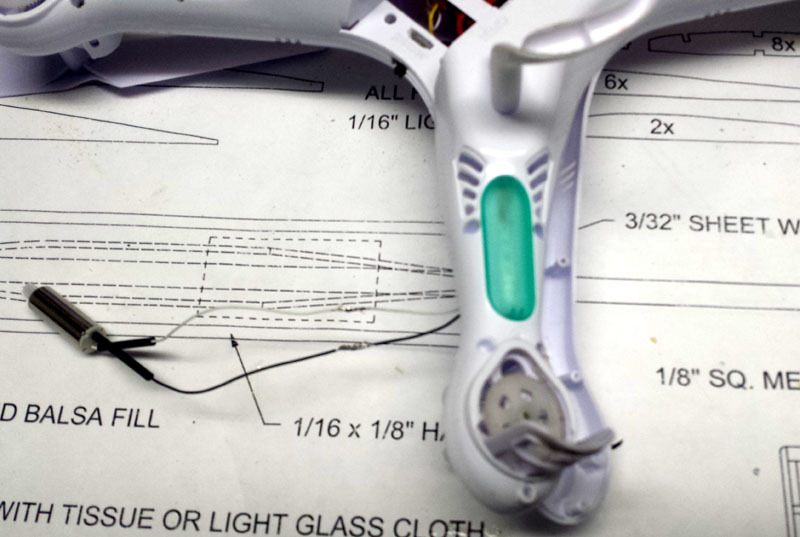 Like any quadcopter you want to make sure you understand the binding and calibration procedures. Flying the Nano seems really easy, I was impressed that a quadcopter this small flies so easily. In the advertising Blade stresses that the Nano has S.A.F.E. technology for stability which is an acronym for Sensor Assisted Flight Envelope. There are two flight modes; stability and agility but so far I have left it in stability mode. 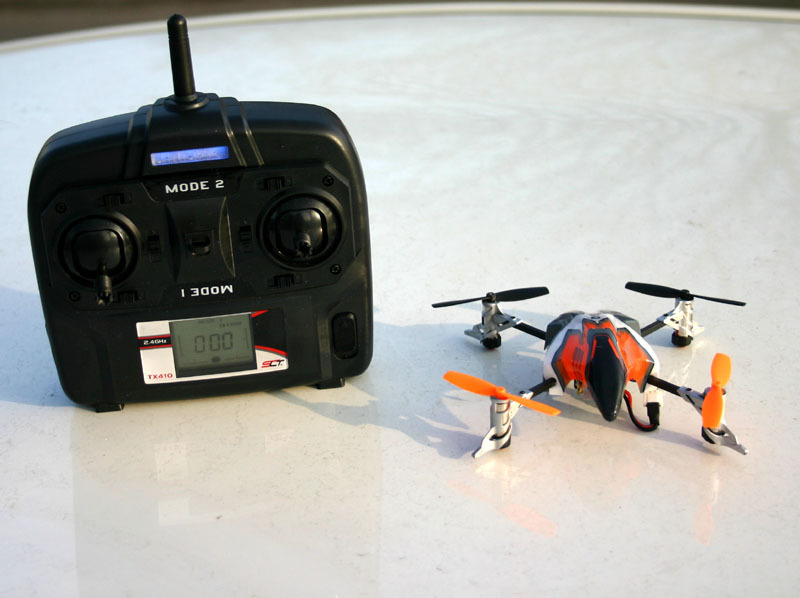 This is the Nano with included transmitter if not purchased in BNF version. Refreshing! I will look forward to future, educational articles. Well done! A good start! I hope to read some more in depth information in the future. You are a good writer and a good read, keep up the good work!! Thank you, I am replacing my first motor this evening. I need to write more about the motors and batteries for sure. 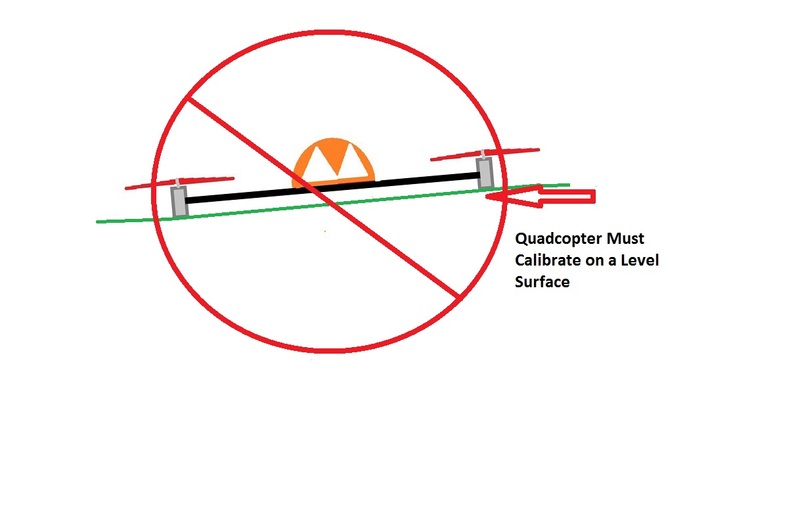 I can used anti clock wise propellers but my quadocopter propellers move one direction left why? 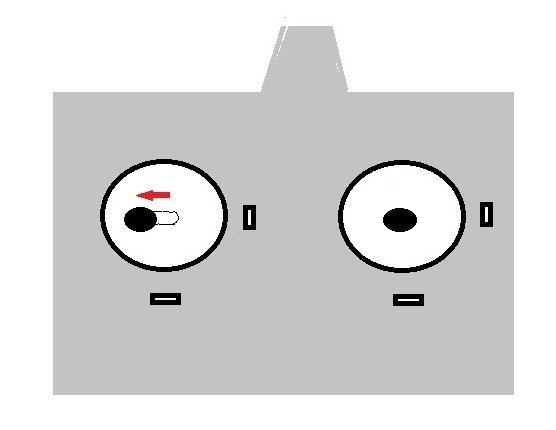 You need a combination of clockwise and counterclockwise propellers as shown in diagram in this article. The motors also should turn different directions and there are special motors for each direction in a brushed motor. Brushless motor direction can be changed by switching leads. In the brushed motor changing leads will damage the motor.